How Do Appraisers Choose Comparable Sales? Home » Appraisal Blog » How Do Appraisers Choose Comparable Sales? What are the guidelines that appraisers go by when selecting comparable sales? 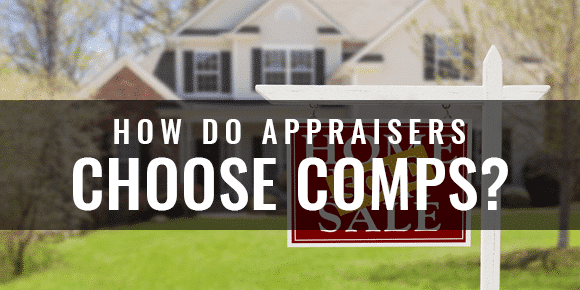 What does an appraiser consider a good comparable? The following are based on typical appraisal guidelines as required by Fannie Mae, Freddie Mac and FHA. An appraiser must have, at the very least, three closed sales as comparables to make statistically relevant adjustments. An appraiser will often use 1-3 active or pending listings as well to show current market behavior including listing prices and days on market. For lending purposes, appraisers are typically restricted to using comparable sales that have transpired within the past six month period. If an appraiser feels he or she needs to use older sales, they can make an exception with good reasons to do so, but typically nothing past 12 months is accepted. If the subject property has sold within the past 12 months, it usually MUST be included in the sale comparison approach. Justifications must be made for price differences between previous sales and current contract price. Many lenders do have a 90 day comparable rule, but appraisers do not have to use sales completed in the past 90 days. If they believe better comparable sales, that are older than 90 days, they are at liberty to use those sales vs newer ones. It might be reasonable for an appraiser to use a nine month old sale with a time adjustment vs a one month old sale that will require multiple adjustments. There are many lenders who want appraisers to stay within a one-mile radius for comps in suburban areas. Fannie Mae does not make that requirement and appraisers should use the most competitive sales available to them. So, how far outside should an appraiser go and where should they go for comps? In some cases, staying within a very local radius will give the appraiser the best comparisons, while in other situations they might have to travel outside that area. Questions you might ask: Would a buyer purchase this comparable if the subject property was not available? Is the comparable in a competitive neighborhood or within the same neighborhood? Would others in the market consider your sales as comparable if it came from a competitive neighborhood? Whether Fannie Mae or other lenders, their rules do not apply to a private appraisal. A private appraisal may take place due to estate planning, divorces, per-listings, tax grievances or other circumstances. These guidelines are still within the guidelines that an appraiser should use for the best sales available. But unlike dealing with lenders, the appraisers are not on a leash. The appraiser does not have to explain why some sales were not within the 90-day rule. With personal appraisals, the heirs or other parties are looking for division of properties, allocation of heirs within a will or various other complications. It has less to do with market opinion or sales to other buyers. In many cases, they are dealing with court settlements and closures. As one of the best Texas appraisal companies, we perform over 1,000 property valuations in the Houston market every year. We offer appraisal services and reports for properties across the Greater Houston Metro area including the counties of Harris, Fort Bend, Montgomery, Brazoria and Galveston as well as parts of Liberty and Chambers. Below are some of the markets within our service area. If your area is not listed, please call us and we will see if we can perform appraisals in your area.